Not standard piano trio, this group features unique percussion with lyrical bass and piano arrangements of originals and standards. 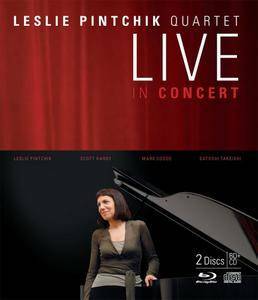 Pianist Leslie Pintchik and bassist Scott Hardy have a musical partnership that spans two decades, and together they have built a library of rich original material. 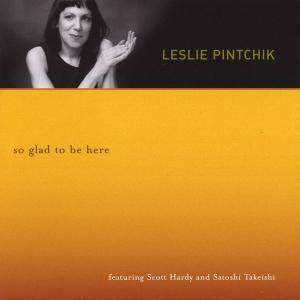 On So Glad to Be Here, Leslie and Scott are joined by percussionist Satoshi Takeishi, whose highly unusual kit (which includes hand drums, bells, cymbals, etc.) adds a dramatic array of colors to the music. The Music-Warmth, humor and mystery flavor this mix of original compositions and jazz standards, in a recording that features rich group interplay and lean textures. 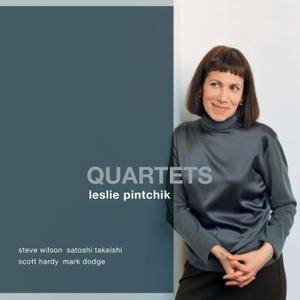 In the follow-up to her debut trio recording, "So Glad To Be Here", pianist and composer Leslie Pintchik returns on her second SACD "Quartets" with two different quartets. The powerful band-mates from her debut album return - Scott Hardy on bass and Satoshi Takeishi on percussion. Added to the mix on the new release are the superb - and deservedly acclaimed - saxophonist Steve Wilson, as well as the exceptional drummer Mark Dodge. The project, which once again features Pintchik's strong original compositions, as well as three unusual arrangements of well-known standards, packs a rich array of feeling into 56 minutes. All the extraordinary color and nuances of the two different quartets are captured beautifully using Sony's Direct Stream Digital (DSD) technology. "Quartets" is released as a multichannel Hybrid SACD, featuring a 5.0 surround sound mix, along with the standard stereo mix. 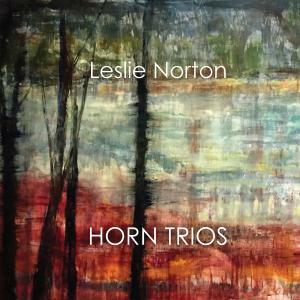 Principal horn Leslie Norton joined the Nashville Symphony in 1990, under the baton of Kenneth Schermerhorn. She has enjoyed a diverse musical lifestyle as a college educator, chamber music artist, and recording studio musician. 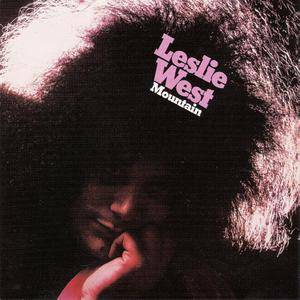 Frequently classified as the first album by the group Mountain, which was named after it, Leslie West's initial solo album featured bass/keyboard player Felix Pappalardi, who also produced it and co-wrote eight of its 11 songs, and drummer N.D. Smart II. (This trio did, indeed, tour under the name Mountain shortly after the album's release, even performing at Woodstock, though Smart was replaced by Corky Laing and Steve Knight was added as keyboard player for the formal recording debut of the group, Mountain Climbing!, released in February 1970.) Pappalardi had been Cream's producer, and that power trio, as well as the Jimi Hendrix Experience, were the models for this rock set, which was dominated by West's throaty roar of a voice and inventive blues-rock guitar playing. Though West had led the Vagrants for years and cut a handful of singles with them, this was his first album release, and it made for an auspicious debut, instantly establishing him as a guitar hero and setting the style of Mountain's subsequent recordings. 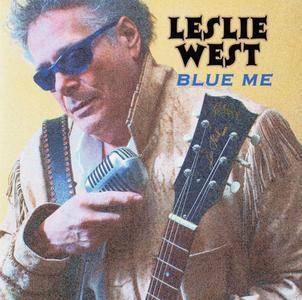 Leslie West 's Blue Me, is a collection of blues standards done in the inimitable West style. Blue Me contains the kind of guttural vocals and soulful bluesy guitar playing that have established Leslie as one of the greatest talents in the history of rock and roll and delivers the kind of high level performance, which West fans have come to expect. 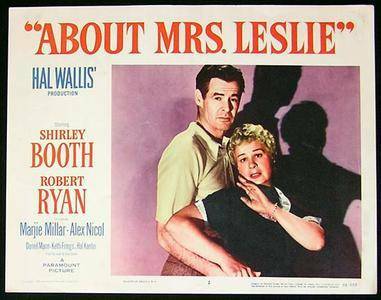 Mrs. Leslie, rooming house landlady, reminisces in flashbacks about her past as a cafe entertainer and her involvement with the mysterious George Leslie, who originally hires her as a vacation "companion" but tells her nothing of his life outside the vacations. 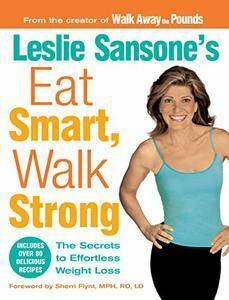 In subplots, Mrs. Leslie's tenants and neighbors carry on soap-opera lives. 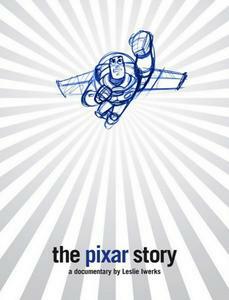 Famed cartoonist Ub Iwerks's granddaughter Leslie turns the camera lens on the artists and storytellers behind some of the most widely hailed animated films of the modern era in the in-depth documentary The Pixar Story. Featuring such key members as John Lasseter, Steve Jobs, and George Lucas, the doc tells the story of the company's humble roots all the way to being one of the biggest power players in Hollywood. 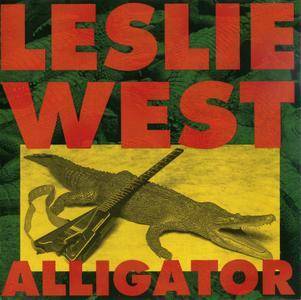 Originally released in 1989 on IRS' Illegal Records imprint, Leslie West's Alligator seemed then and still seems now, as evidenced by this straight reissue from Voiceprint Records, to be mostly West treading water. He plays some hot guitar here, of course, but then not as much as one might like, and he sings a lot here, too, perhaps more than one might like. It all adds up to a rather ho hum album without a single track that really takes your head off, although the flashy "Hall of the Mountain King/Theme from Exodus" mini-suite sure aims for sonic decapitation, as does the screeching "Whiskey" (featuring bass by Stanley Clarke), and West's cover of Screamin' Jay Hawkins' "I Put a Spell on You" is certainly atmospheric enough, but in the end it all seems more like cage rattling than a substantial musical statement. Stick to the early Mountain records for West at his best.